with a little sea salt and add to the olive oil, stirring occasionally, until golden brown, about 5 minutes. 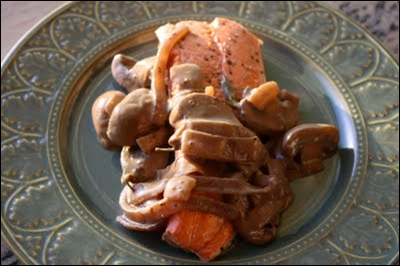 the mushrooms and onions and de-glaze. Simmer gently and cook until the balsamic is reduced by half. Add the cream, and stir to combine. Cook until the mixture thickens slightly, approximately another minute. Season with salt and pepper to taste and reserve. Lightly score the salmon skin in several places with a sharp knife without penetrating the flesh. Pat the fillets dry and season with salt and pepper to taste. In a pan large enough to hold the fillets, heat 2 tablespoons of EVOO over medium high heat. Pan sear the fillets, for approximately two minutes per side, taking care not to overcook.